I was playing my dulcimer the other day, when a couple approached me. "I have one of these," the woman said; "I have the instrument, the stand, the case, the hammers, the electronic tuner, everything you need. Now I just need someone to teach me how to play." I made a recommendation as to a potential teacher who lives in the general area, but the woman expressed disappointment that she would have to drive a little distance to get lessons. She informed me that she was an experienced musician, so I suggested that perhaps she could teach herself, as I (and many of my fellow players) had done. "Oh, that won't do," she replied. "I've already tried, but I can't figure it out. I'm sure that if someone would help me get started, I'd have it mastered in no time." The couple lingered. While continuing to play, I asked what type of instrument she'd purchased. "It's a Dusty Strings. At least the same size as yours, and probably bigger." Greg, overhearing this, brightened. Thinking to make a connection with her, he said, "Sam Rizzetta, who built Marcille's dulcimer, is the man who did the basic designs for the Dusty Strings company." She flinched in disbelief, blurting out, "But my instrument is very beautiful. It's got a rich-looking mahogany-colored top. It's an exquisite piece." Briefly, I look at my own dulcimer through her eyes. It's 17 years old, now, and no one would describe it as cosmetically beautiful any more. My hand traces the side rail, finding the small dimple I put in it less than 24 hours after taking possession of it: I'd slipped on ice when carrying it from my hotel room to the car. My mind still hears the rich chorus of tones that reverberated from inside the case, and I recall gingerly walking back to the room, my heart in my throat the entire time, to inspect the instrument to be sure that no major harm had resulted from my carelessness. Sliding my hand further along the rail, I find one jagged, rough corner and recall the time that a gust of wind blew the dulcimer onto the pavement during a street fair in Dunedin, Florida. The time that the hickory nut fell out of the tree during a rehearsal in Ohio -- I still can't figure out how that nut managed to slip so perfectly between the strings to leave such a relatively large indentation! The time that I was hustling to get off stage after performing at a festival in North Carolina -- I dropped one of my telescoping legs and left a gouge in the sound board. The time that our band was giving a free "St. Patrick's Eve" concert to a Punta Gorda, Florida audience still shell-shocked from a punishing hurricane season -- the performance venue had not yet been able to repair the canopy over their stage, and the sudden rainstorm that blew in left a few water marks that I've not been able to rub out. My dulcimer has endured snow flurrying onto it during a performance at Tennessee's Dollywood. Its tuning pins are ever so slightly corroded from salt air exposure up and down America's eastern seaboard, from Florida to Maine. It's been played in 100-degree-plus temperatures in Milwaukee, Wisconsin and sub-freezing temperatures in Orlando, Florida. It's collected dust at fairgrounds in Michigan and New York and in Georgia's Stone Mountain Park. It's traveled hundreds of thousands of miles and played millions of tunes. It's been fondled by quick, sticky-fingered children with slow-footed parents. It's been embraced by the hands of hearing-impaired persons who wanted to experience its sound through its vibrations. Its strings have been traced by the fingers of sight-impaired individuals who wanted to "see" it through their sense of touch. To me, the scars and imperfections are "character marks." Like the wrinkles and dark spots on the face of an elderly person, each one was attained through mostly natural use, and perhaps occasional misuse, but each "flaw" has a story to tell. It is evidence of a full life, fully lived. And to me, it is beautiful. I jarred back to the present, at a loss for words. The slight was probably unintentional, but even if it was not, any response from me would have been unjustified. After a few minutes, the couple moved on. I caught Greg's eye. "Honey, don't even think about it," he consoled. "Oh, I'm not insulted by what she said, Greg. She's looking at the dulcimer as if it's a fine piece of furniture, rather than a musical instrument. She'll figure it out eventually ... or not." He smiled. "Well, I'm glad you didn't say anything to her." "I know how to play mine." Not long ago, in fact during the Grandfather Mountain Highland Games, a woman lingered a little past "closing" to talk with Greg and me about being "Celtic." For the record, our basic view of "Celtic" includes what are traditionally called the "Seven Nations": Ireland, Scotland, Wales, Brittany, Cornwall, Isle Of Man and Galicia and their languages, music, culture, etc. We do also embrace things that have a Celtic influence, such as bluegrass music. And though historians seem constantly to be revising the story of the people who once dominated Western Europe prior to the heyday of the Roman Empire -- aka The Celts -- we recognize a certain Celtic influence that reaches as far as Turkey (Galatia, which you may know from the New Testament), Ukraine (Halychyna), and Iran (Scythia), among others. At one point during the conversation, the woman noticed the cross I was wearing and asked if Greg and I were Christian. When I replied that we were, she nodded to our two hymn titles (Be Thou My Vision and A Mighty Fortress) and said, "I thought so," then "How do you justify that with being Celtic?" It's not the first time I've been confronted with the notion that one cannot be both Celtic and Christian. And though the short answer is that there is absolutely no conflict between the two, the question does deserve some sort of explanation. I've never seen the question as a challenge, but rather I've seen the questioner as a seeker -- and yet I've never worked out an honest, concise, and accurate response. I've been thinking about it, though. I won't be disingenuous and pretend that I don't understand why someone would ask such a question. I know that in the minds of many, Celtic = Pagan. Yes, it's true that the ancient Celts were Pagan -- as was most of the rest of the world. And it doesn't much matter what definition of "Pagan" you consider "correct" -- if you consider Pagan as a catch-all term for polytheistic religions, keep in mind that in the centuries and millenia before the Christian era, the only monotheistic religion was Judaism. And if you consider Pagan as a catch-all term for non-Christian religions, keep in mind that the heyday of the Celts was in the pre-Christian era. Though I claim a Celtic ancestry, I feel no more bound to their ancient religion than I am to any other aspect of their way of life -- like cooking over an open fire, walking or riding a horse as my primary mode of transportation ... or living without air conditioning! In fact, when Christianity was introduced to the Celts, many of them quickly and enthusiastically embraced the new religion, in part because many of its tenets were similar to their own beliefs: the belief in an afterlife, for example. I'm still working on a nice way to express my thoughts and beliefs without offending by appearing too glib or too self-righteous. I would never want to turn someone away because they felt that I was putting their beliefs down. If anyone has suggestions/insight/input, please share! We are being tormented by one of our neighbors. This neighbor, a year-round denizen of the Asheville East KOA, is cunning and daring, and a master of disguise, fearless when making raids near our campsite and equally fearless when we accidentally invade his territory -- which is seemingly everywhere and anywhere he chooses to be. We know him as Ambush Bunny. Make no mistake. The Ambush Bunny is not your usual silly, timid rabbit. He is bold, hopping down the middle of the road that runs past our campsite. His coat blends in perfectly with the colors of the asphalt and the fallen leaves on the side of the road, so he often hops along undetected until Maggie catches his scent. He seems to understand just exactly how long Maggie's leash is, so that if we encounter him while on a walkie, he does not move away until we are within about three feet of where he is standing. And he does not make quick little moves, like most rabbits! If a rabbit can saunter, Ambush Bunny saunters. He does a "hop-by" our campsite almost nightly, which poor Maggie finds so maddening! She strains at her tie-out, occasionally letting out a frustrated bark, and I'd almost swear that I hear Ambush Bunny chuckling in undisguised glee. I've wanted to write about Ambush Bunny for a couple of years, but couldn't figure out exactly how to describe him so that you could understand his devilish character. Last night it occurred to me: think Bugs Bunny torturing Elmer Fudd, and you'll get the picture! There's no supermarket in White Springs. Actually, these days, there's not a whole lot of anything. There's a post office, of course ... a couple of fuel stations which offer some convenience items ... a Dollar General store, a bank, maybe a couple of antique stores and the Suwannee Yoga Center. And a few churches. The State Folk Culture Center is here, and when it hosts the Florida Folk Festival in May, the town's population will temporarily swell to about ten times its usual 800-900. It's a sleepy, tranquil place; as Greg observed today, "Life's a lot slower here, and it forces you to slow down too ... and that's nice." In its heyday, White Springs was a busy place. It was Florida's first real tourist attraction, drawing visitors to the healing waters of the White Sulfur Springs as early as the 1830's. The excellent surrounding land supported a thriving cotton industry, and the pine forests provided timber and other products such as turpentine. White Springs became a refuge for Southerners displaced by the Civil War. Centuries prior to all that, the healing mineral springs were considered by the Native Americans to be a special, peaceful place where warring tribes could come to put aside their differences as they drank and bathed in the waters. But all that was long ago, and though many of the old structures remain, White Springs itself no longer bustles with commerce. It probably began its decline before the advent of the supermarket. And since White Springs does not boast any of the components that make up the modern supermarket -- bakery, butcher, green grocer, dairy market, etc. 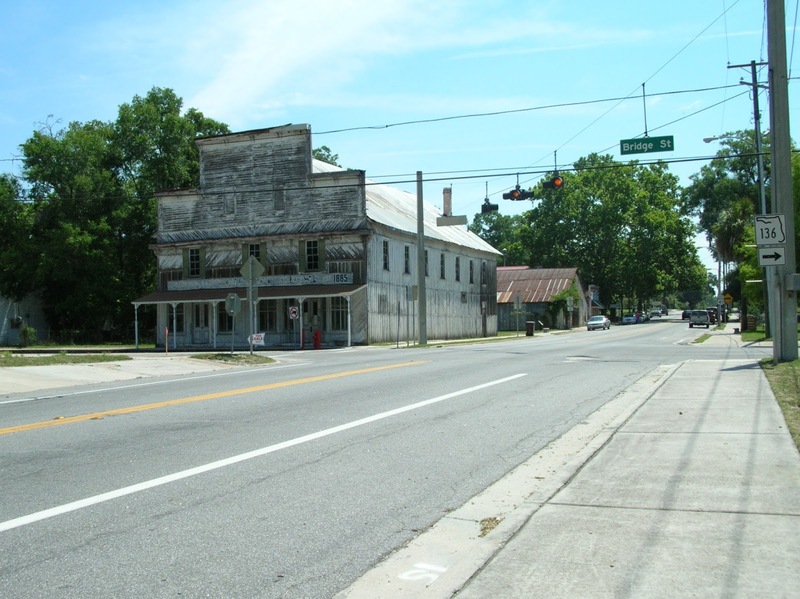 -- I headed over to Live Oak, one of the neighboring towns 14 miles away, to do our weekly shopping. Such an arrangement requires considerably more planning than I've become accustomed to. But this is the way I grew up, so I know it's entirely possible! Live Oak is much larger than White Springs, but it's still a fairly small town. My shopping experience was at first a bit frustrating, as it seems that the Publix grocery store is the place to meet and visit friends. When I shop, I'm used to being able to easily navigate nice, wide aisles; I didn't care much for dodging shopping carts while their drivers chit-chatted about yesterday's church social, or the upcoming school function. But I remembered what Greg had said earlier, and I eased up and slowed down. I also remembered how, growing up in a small town very similar to Live Oak, I hated for people to come in and try to impose their standards on our way of life. Leaving the store with my purchases, I was assisted by one of the "baggers," an older gentleman who commented on the day's beautiful weather. "Now if it was just like this every day of the year, it'd be all right," he said. I smiled and said, "If it was like this every day of the year, everyone would want to live in Live Oak, then pretty soon you probably wouldn't want to live here any more." "I reckon you're right," said he. "I lived in Miami for a while and it got to be too much of a mess for me. That's why I moved here; it's quiet and it suits me just fine." Yes, life's a lot slower here. It forces you to slow down too ... and that's nice.